Whether you are looking to locate or relocate your company or your family we urge you to check out the towns of North Liberty & Walkerton. 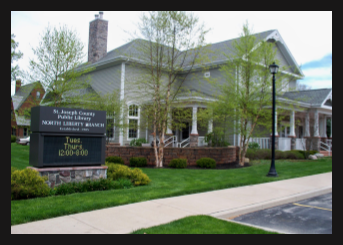 Not only are they positioned perfectly in southwest St. Joseph County, but they are everything small towns should be; safe, clean and charming. Both towns have Industrial Parks, nationally and internationally known companies and a sophisticated approach to working with potential new businesses. 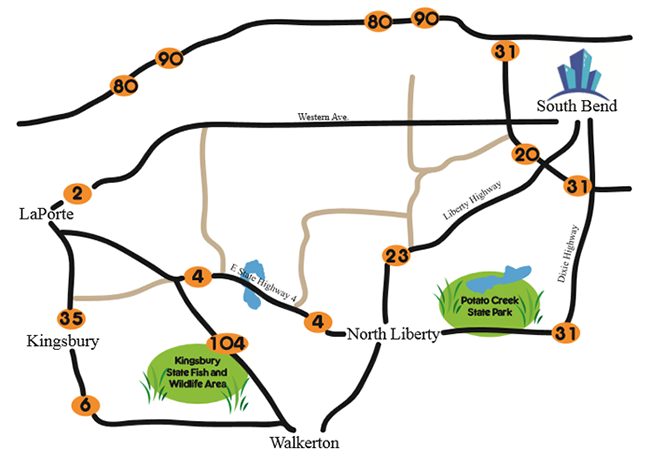 State Roads 23 & 4 run through North Liberty and US Highway 6 and State Road 23 run through Walkerton. Both towns are mere minutes to US 31, US 35 and Interstates 80/90 –the Indiana Toll Road. They share a progressive school system; John Glenn School Corporation is one of the finest in the country, in the top 7.5% nationwide according to US News. John Glenn High School was rated higher by US News than any other high school in the area and graded an “A” school by the Indiana Department of Education. It boasts a 97% graduation rate and 97% of students show mastery in Algebra. In addition, they offer foreign language classes in French, Spanish and Chinese, as well as a fine Performing Arts Program and an excellent Building Trades Program that produces work ready graduates. Their awards and list of achievements is too long to mention, but in short they have an excellent school system turning out well educated adults. The North Liberty Christian School provides another option for children K through 6th grades. There is virtually no serious crime in either community. Each town has a well trained police force that brings common sense to their jobs. The shop owners know customers by their first names and the streets are safe and walkable. The parks are attractive and clean; perfect for sledding in the winter or playing a pick-up game of basketball in good weather. This is Indiana and we do love our basketball. The selection of homes runs the gamut from lovely old Tudors in the middle of town to new developments at the edge of town – all amazingly well priced. There is something for every lifestyle and family make-up. The fact that we are a mere 20 minutes to all the cultural venues and restaurants of South Bend, a short trip to Lake Michigan and a train ride to Chicago makes our communities even more attractive. Closer to home we have the exceptional Potato Creek State Park with biking/hiking trails, cabins, a nature center and the 327 acre Worster Lake. Golf enthusiasts frequent Whispering Pines 18 hole course and Swan Lake Resort, which is home to the United States Golf Academy. The resort offers two eighteen hole championship golf courses and a PGA professional staff. An added attraction is Koontz Lake just down the road. These are communities where solid values matter and quality of life is important. They teach their children to be respectful and to take pride in the work they do and the lives they lead. 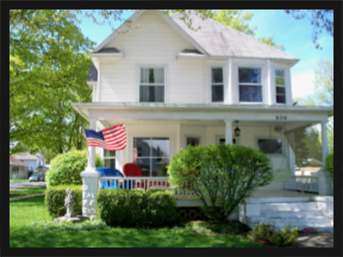 So whether you are looking for good neighbors or good employees with excellent work ethic, we think you can find them in North Liberty, Walkerton and Southwest St. Joseph County.